From the company that invented multifunctional headwear, BUFF UV multifunctional headwear delivers all the functionality of the Original multifunctional headwear, then adds built-in-sun protection that blocks up to 95% of UV rays. The COOLMAX PRO fiber wicks moisture and dries fast for comfort on the move and the Polygiene treatment resists odors so you can wear it more and wash it less. The ingenious seamless design minimizes irritation for long-term comfort. Exceptionally adaptable, BUFF UV multifunctional headwear can be worn 12 different ways - from cap to balaclava, neck gaiter to hair tie - for optimal performance and protection, personalized style, and a perfect fit. COOLMAX PRO: A special four-channel fiber forms a transport system that pulls moisture away from the skin to the outer layer of the fabric. It then dries that moisture faster than any other fabric to thermoregulate the body. * UV PROTECTION: 95%: Samples of fabrics have been tested for erythermally effective UV protection by LEITAT-Textile Technology Institutes in accordance with the standard AS/ NZS4399:1996 \x93Sun protective clothing-Evaluation and Classification\x94, results ranged from 93,3% (UPF > 15) to 96,7% (UPF>30), averaging 95% UV protection (UPF>20). It all began in 1991 on a bike. Charged with a passion for motorcycles, our founder, Joan Rojas, sought to find a solution to keep his neck and head protected on his cross-country rides. Plucking from his knowledge of tubular knitting, he churned out the first BUFF headwear product, focusing on supreme craftsmanship, and tested it as he traveled the length of the Pyrenees. BUFF , short for bufanda, which means \x93scarf\x94 in Spanish, was born. Partnering with superior manufacturers of raw materials, over the past 25 years, BUFF has premiered and innovated the tubular headwear category. Our company-owned factory, which is located downstairs of our headquarters in Spain, allows us to ensure that, start to finish, excellence is built into every product. Today, just as then, BUFF headwear is a product built on this ethos of quality; it\x92s in the marrow of our company. Technology has progressed and the industry of textiles has moved into a new age, and we have evolved with it. While we incorporate state-of-the-art fabric technologies, like COOLMAX and Polygeine, into our products, we stick to our heritage of quality and reliability. It\x92s these time-tested qualities that athletes and outdoor enthusiasts from an array of sports depend on, and why BUFF is the original multifunctional headwear. We invite you to become part of the BUFF revolution. 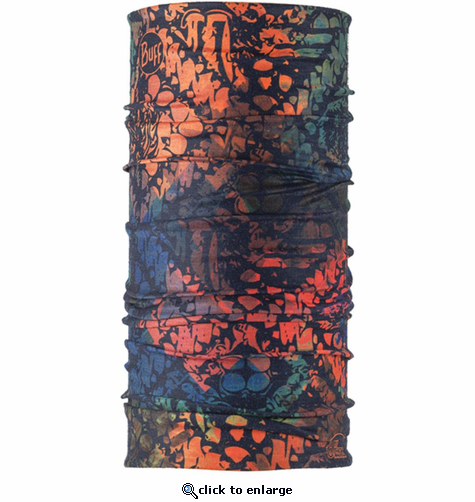 See for yourself why BUFF headwear is the perfect accessory for any outdoor activity.